Once - a long time ago - Ross Caldwell and me started to collect "Trionfi card notes" during 15th century. It had been then in the begin of Trionfi.com in 2003. Gherardo Ortalli was very friendly and had send us an edition of Ludica 1996, which contained the article "Gherardo Ortalli: The Prince and the playing cards. The Este family and the role of courts at the time of the Kartenspiel-Invasion (p. 175-205)." The text was full of details, which weren't presented by Michael Dummett in "Game of Tarot" and also not in the Tarot Encyclopedias of Stuart Kaplan, then the base laying works for the international web discussion. Though the text had been in English, and was already 7 years old, the details of the article more or less had stayed unknown. We did our best to improve the situation, occasionally adding something to our collection (now an "old collection, overcome by time, and updated at another place with another structure) and Ross Caldwell wrote a review on it. A rather important point: The article contained some notes to the Trionfi card document in 1457, which mentioned, that 2 produced decks contained only "70 carte", and not "78 cards", as many would have expected. The document played a big role in the later discussions about the 5x14-theory. From the perspective of Trionfi.com the year 2012 had been the most successful in the 10-years-old history of the website. Progress occured in many aspects, and it's too much to list it all, so I don't start to do it. Most dominating had been the new cooperation with Franco Pratesi, which led in the past 22 monthes now to 57 new articles, and to the re-publication of some older reports from Franco's earlier work. The number is indeed impressive, but more valuable are the real results. And these are so, that we can speak of a Trionfi card revolution inside the more than 300 years old attempts to clear the riddle of the Tarot cards and its origins after the humble start of Père Menestrier in the year 1704. 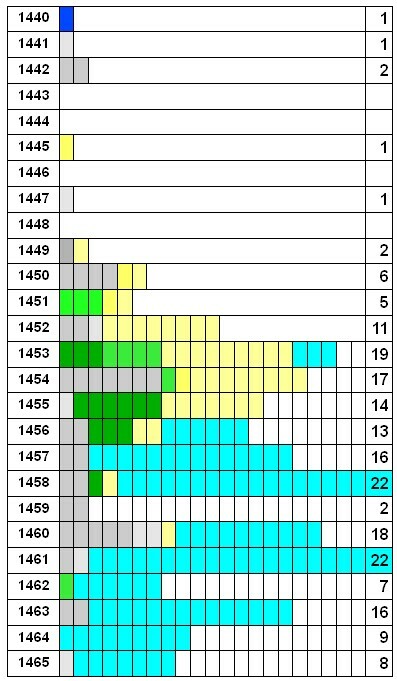 Before November 2011 we had for the period 1442-1463 c. 35 documents about Trionfi cards, now it are c. 200% more for the period 1440-1463. The most impressive new finding are the account books of two otherwise rather unknown Florentine silkdealers Lorenzo di Bartolo and Matteo di Zanobi, who in a side business also traded with playing cards and in more than 500 records sold or acquired playing cards between 1431-1460 we have also 41 notes about Trionfi cards, so nearly 2/3 of the new insight possibilities. The records open the field of the cheap decks produced in Florence, which is quite different to the earlier known high-price Trionfi card records mainly from the Ferrarese court. Cheapest common playing cards have 1-2 Florentine soldi prices, cheapest Trionfi decks take usually 9 soldi (mentioned for the first time in 1449) and only in two cases a little less. From the price one possible may conclude, that Trionfi decks still were expensive for the middle cass, but not totally out of reach in 1449. Through the silk dealer records we know also about Florentine playing card suppliers, likely producing artists. Antonio di Dino (mostly middle class playing cards, usually 5 soldi and Trionfi cards later), Antonio di Simone (expensive cards only, usually c. 9 soldi, no Trionfi cards) and Niccolo Calvello (the cheapest playing cards, he sold more than 3500 decks to the silk dealers) are the major suppliers till c. 1450-1456, dividing then the business in three classes for this period. In 1450 Matteo Ballerini appears in the Silk dealer's playing card business and he becomes the major supplier for the the time 1453-1460. He's the momentary record holder for known Trionfi card productions. Other new Trionfi notes relate to Filippo di Marco, a painter in the class of Jacopo Sagramoro and Gherardo da Vicenza, comparable in his known productivity and also for his prices. Beside these there are many other new names to consider. The art researcher Schreiber attested in 1938 for the city Nuremberg 38 named card producer during 15th century and had this as an European record in his collection, in the momentary Florentine research situation we've meanwhile more than 40 names of suppliers of playing card products till 1460, so in a far shorter period. The year 2013 had been been a long time less exiting. Franco Pratesi had his research focus on the later development of Minchiate and Playing Cards in Tuscanyand his results are excellent and astonishing, as usual, however, our main interest is definitely on the "origin of the Trionfi cards". Nonetheless his work is impressive and I've sorted the articles from 2011-2013, which related to the Minchiate Research at an own page to create an overview of the progresses. Now, as a reaction on our increased web activities in 2012, Prof. Dr. Arnold Esch has organized a second review on Trionfi card documents in a custom register in Rome (compare the article 1453 AN EARLY ARRIVAL OF TRIUMPHS INTO ROME, and published the result in a 13-pages article in the Gutenberg Jahrbuch 2013 ( Aus der Frühgeschichte der Spielkarte. Der Import von carte da giocare und trionfi nach Rom 1445-65. By Arnold and Doris Esch, Gutenberg Jahrbuch 2013, 88. Jahrgang, p. 41-53; webpage in preparation ) and it's full with new Trionfi card documents (we counted 107, from which 106 were new to us). In summary one can say, that Franco Pratesi had increased the number of very early Trionfi documents with "200 % more" in 2011/2012, and Arnold Esch had countered the new state of 2012 with about 100+ documents by doubling the already astonishing increase in the collection. So, in short, there are about 500 % more Trionfi card documents than there had been before November 2011. In c. 2003 the perspective of Tarot origin research could be described with the following graphic: Black and red points stood for documents, which contained the word "Trionfi" or similar in relation to playing card notes. Black stood for "document from Ferrara" and red stood for "document from elsewhere", so definitely Ferrara had been then very dominating. The numbers indicated the years 1442-1463. The whole had been mainly based on the text "The Prince and the Playing Cards" (1996) published by Gerardo Ortalli and based to great parts on the researches of Adriano Franceschini, which had been in this aspect then a great improvement against the earlier works of Dummett and Stuart Kaplan, which earlier had been of great value for the increasing English discussion of Tarot History. A recent attempt to produce a similar graphic for the research state of September 2013 gives a new picture. I've to excuse, that it might contain still errors and also it contains some critical documents, which are interpreted by some as Trionfi documents, but not by others. And the counting system against the presentation attempt of 2003 has changed a little bit. Beside these weak points there is naturally the good side effect, that one gets a global impression, how much has happened in the meantime. The colors lead to specific developments in the researcher time, and indicate the articles, by which the entries became known in the Tarot History researcher world. For "dark grey" and "before 2003" we've mostly the already mentioned "The Prince and the Playing Cards". For light grey we've the time, when Trionfi.com had started and organized a collection of the documents. The improvements of the lists were rare events till Franco Pratesi started to become again engaged in Playing Card History. This happened in November 2011 in context of the detection of a new Arnold Esch report in 2007, who had noted some Trionfi card documents in a custom register in Rome. Franco made then his own researches in Florence and detected all the documents, which are indicated in green and yellow. This had been really a great time. The number of documents had been increased by c. 200 % then. The attention in research, mostly used to focus on Milan, Ferrara and Bologna, had turned to Florence. A small book with 118 pages has appeared in 2012 as IPCS Paper No. 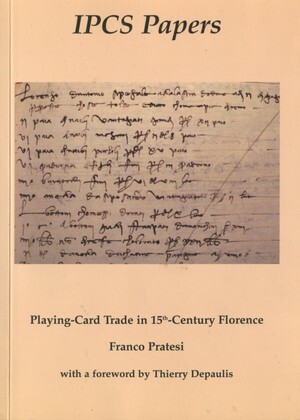 7, Franco Pratesi: Playing-Card Trade in 15th-Century Florence (ISSN 0305-2133). It contains 11 articles, which before had appeared at this website and a foreword by Thierry Depaulis, in which is stated "This book is a landmark in the history of early playing cards in Italy", and a final commentary by Franco Pratesi with "Personal memories and Acknowledments", in which also the sentence appears "Essential for passing from the lines written with pencil on my blocknote to published notes has been the box offered by Lothar Teikemeier in the web pages of trionfi.com. This has allowed me to write my comments without waiting too long". Generally I think, that an author needs a feed-back and he needs it quick in a time, when his mind is just occupied with his topic, a 1/2 year later he might have forgotten about all the details. Inside the web response and following questions and answers have quick ways, in the reality of newspapers and books with lay-out and printing problems and editorial decisions the ways are long and slow. Naturally such products are not of the same quality, maybe articles and book-content have the advantage to have been considered more careful, cause they can't be repaired in short time. But web products in their dynamic discussion can follow easier the flow of research, and can produce new ideas, find connections to other sources and create new developments. Maybe some IPCS members are reached by these words. A general meeting point for Web-Tarot-Historians is the Forum for Tarot History, with some focus on 15th century. If this is one of your interests, you're welcome. It doesn't need any "formal membership" and you need no money. A New Webpage Segment: "beta version"
Trionfi.com is interested to be informed about new developments. If you've a news to spread, we like to hear about it.